Can Dündar ble arrestert sammen med sin kollega Erdem Gül 26. november 2015. Can Dündar var på det tidspunktet sjefredaktør av den tyrkiske avisa Cumhuriyet. De ble siktet for å ha avslørt statshemmeligheter, spionasje og for å ha hjulpet en terroristgruppe. Anklagene var begrunnet i publiseringen av video- og fotografiske bevis på at den tyrkiske etterretningstjenesten smuglet våpen til islamistiske grupper i Syria. Dündar og Gül tilbrakte 92 dager i fengsel før de ble løslatt i påvente av rettssaken, 26. februar 2016. I mai 2016 ble Dündar dømt til fem år og 10 måneders fengsel. Can Dündar er en av Tyrkias største mediepersonligheter. I tillegg til sitt arbeid som journalist har Dündar utgitt over 20 bøker, produsert utallige tv-programmer og skrevet og bidratt til filmmanus og dokumentarer. Han skrev manus til og regisserte filmen Mustafa (2008), om livet til den tyrkiske lederen Mustafa Kemal Atatürk. Samtalen ledes av Silje Kampesæter. Silje Kampesæter er frilans journalist med bakgrunn fra NRK, Dagbladet og Aftenposten. Hun var Aftenpostens Midtøsten-korrespondent i perioden Can Dündar ble arrestert, siktet og dømt. Can Dündar er æresmedlem av Norsk PEN, les mer om ham her. Samtalen arrangeres av Norsk PEN, Norsk Redaktørforening og Nobels Fredssenter. Born in 1961 in Ankara, Can Dündar is a journalist, columnist, and documentarian. After completing his studies in journalism in Ankara, Dundar went on to obtain a Master’s degree from the London School of Journalism, and a Ph.D. in Political Science from the Middle East Technical University in Ankara. 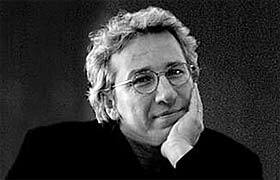 Alongside his work as a journalist, Dündar has published over 20 books, produced numerous television programs, and has written and contributed to screenplays and documentaries, most notably Mustafa (2008), chronicling the life of Turkish leader Mustafa Kemal Atatürk, which Dündar wrote and directed. Dündar’s primary contribution, however, has been his unwavering dedication to a rigorous brand of journalism that unapologetically demands honesty, transparency, and accountability from its government and political parties. It is this very dedication, however, that has unfortunately led him into a position of conflict with the Erdoğan regime – a position in which Dündar, at one point, was forced to choose between freedom of speech and freedom itself. Dündar has contributed to various print publications over the years, including Hürriyet, Nokta, Sabah, and Milliyet, before being appointed in February 2015 as the editor-in-chief of the center-left newspaper Cumhuriyet. In January 2014, evidence emerged exposing Turkish National Intelligence Agency (MİT) trucks intercepted at the Syrian border, illegally shipping arms to Syrian rebels. 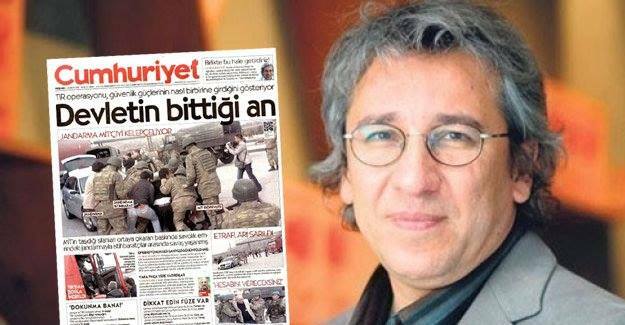 The story’s publication in May 2015 immediately situated Dündar and the daily’s Ankara bureau chief, Erdem Gül, as prime targets in a regime that is increasingly stifling the freedom of its press. President Erdoğan filed an individual criminal complaint against Cumhuriyet; as a result, Dündar and Gül were arrested in November 2015 in Istanbul, and charged with espionage, collecting and disclosing state secrets, and supporting an armed terrorist organization. Dündar and Gül spent over 90 days in pre-trial detention, including periods in isolation and solitary confinement, and although the journalists were freed in late February under a constitutional court ruling, the indictment ultimately led to a conviction on May 6, 2016, in which Dündar was sentenced to a reduced 5 years and 10 months imprisonment, and Gul was sentenced to 5 years. This devastating decision was immediately followed by an equally drastic event: an attempt on Dündar’s life the same day, on the courthouse steps, during which his wife, Dilek, aided in detaining the shooter. In August 2016, Can Dündar stepped down from his position as editor-in-chief of Cumhuriyet, though he will still be active as a columnist, and tireless in his personal and professional efforts to protect the freedom of the press in Turkey. Throughout his persecution, arrest, detention, trial, and appeal, Dündar was adamant in his position to remain in Turkey, to fight from within its borders to preserve media integrity and protect their rights to a free press. Now, however, upon his release pending appeal, Dündar has left Turkey for the moment, dismayed and unconvinced that he would be able to receive a fair trial under the current regime. Dündar has stated that, “the state of emergency [is] being used the government as a pretext to control the judiciary”, and as such, it would be highly unlikely for him to receive a just, impartial, or public hearing, offering very little hope of the overturn of his conviction. The already hostile climate for dissidents and opposition in Turkey was exponentially exacerbated by the coup attempt in July 2016. Reporters Without Borders (RSF) names Turkey the “world leader in imprisoned journalists”, and their World Press Freedom Index for 2016 ranks the country as 151st of 180. The organization reports: “[i]n the draconian state of emergency imposed after the abortive coup, the authorities have closed more than 100 media outlets critical of the government, placed 42 journalists in provisional detention and banned many others from travelling abroad”. Spring 2016 saw the publication of We Are Arrested: A Journalist’s Notes from a Turkish Prison, Dündar’s account of Cumhuriyet’s decision to publish the controversial story, and his subsequent arrest and imprisonment, and the social and political events that led up to and followed the failed July coup. In March 2016, Norwegian PEN organized a protest outside of Parliament in support of Dündar, Gül, and several other imprisoned or at-risk journalists in Turkey, such as Aslı Erdoğan. At this time, Norwegian PEN also announced its decision to adopt Can Dündar as an honorary member, in celebration of his monumental contributions to the protection of freedom of speech and human rights, particularly in the face of severe persecution, threats, and imprisonment. Dündar has also been honored with the International Press Freedom Award (Committee to Protect Journalists, CPJ, 2016), and the Prize for the Freedom of Future of the Media (together with Erdem Gül, Leipzig Media Foundation, 2016). Cumhuriyet also received the Reporters without Borders prize in the media category for 2015. Tyrkisk rett har avgjort at rettssaka mot journalistane Can Dündar og Erdem Gül skal gå for lukka dører. Norsk PEN er bekymra for at dette vil føre til svekka rettstryggleik for dei to, og har i dag sendt nye protestbrev til den tyrkiske presidenten og til justisministeren. 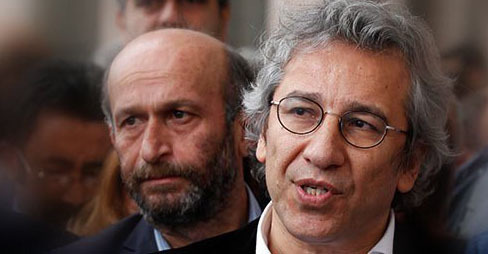 On behalf of Norwegian PEN I need to express serious concern at the Turkish Court’s decision to close the trial of journalists Can Dündar and Erdem Gül to the public and press. We believe this undermines their right to a fair trial and is yet another example of attempts by the Turkish authorities to supress all critical reporting. Norwegian PEN urges the court to reopen the trial to public scrutiny and guarantee due process for the defendants. 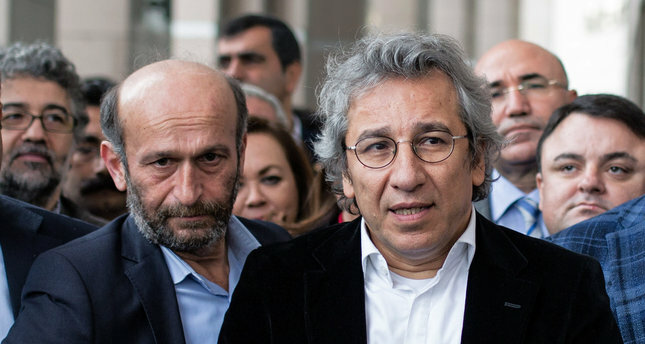 Our Writers in Prison Committee has chosen Can Dündar as an Honorary Member of Norwegian PEN. As far as we can see, he has solely exercised freedom of expression in his duties as journalist, and we call on the Turkish authorities to drop all charges against him and other Cumhuriyet staff members. There must be an end to bringing cases against writers and journalists engaging in legitimate political criticism, as Turkey has the obligation to respect the right to freedom of expression under the European Convention on Human Rights (ECHR) and the International Covenant on Civil and Political Rights (ICCPR), to which it is a state party. Stans kneblingen av Tyrkias frie stemmer! så godt å se dere her! Dette er en viktig samling, vi er alle samlet fordi vi er dypt bekymret for utviklingen i Tyrkia. Utgangspunktet for denne markeringen var en oppfordring fra PEN International til alle nasjonale PEN-sentre i verden, ca 150 i tallet, om å markere at det i dag er 100 dager siden fengslingen av de tyrkiske journalistene Can Dündar og Erdem Gül. Journalistene ble løslatt for en uke siden, men siktelsene mot dem står ved lag og de risikerer livstid fengsel. PEN International er verdens største ytringsfrihetsorganisasjon. Norsk PEN er den norske avdelingen av PEN International og den eneste norske organisasjonen som utelukkende jobber med ytringsfrihetsspørsmål. Norsk PEN har i flere tiår hatt et sterkt og glødende engasjement for ytringsfriheten i Tyrkia, vi har fulgt fengslingsmøter og rettssaker mot journalister, forleggere og forfattere, publisert rapporter, arrangert seminarer, debatter og jobbet aktivt opp mot politikere i inn og utland. Mellom august 2014 og mai 2015 saksøkte president Recep Tayyip Erdogan mer enn 67 personer for å ha fornærmet ham online. I følge Den europeiske menneskerettighetsdomstolen hadde Tyrkia flest domfellelser som angikk ytringsfrihet i 2015. Mer enn 1200 akademikere i Tyrkia etterforskes av påtalemyndigheten for å ha engasjert seg i ‘terroristpropaganda» etter at de signerte et opprop som oppfordret myndighetene i Ankara til å stoppe «sin tilsiktede massakre» på befolkningen i den kurdiske regionen. Rundt dere her i dag ser dere navnet på 50 journalister, dommere, forfattere og akademikere, tyrkere og kurdere, som alle har vært blitt rammet av Erdogans beinharde kneblingspolitikk. I dag er situasjonen i Tyrkia så ille at da oppfordringen kom fra PEN International måtte vi mobilisere, vi måtte lage en markering som gjenspeilet alvoret. Det gjelder fremtiden til Tyrkias befolkning, til Europa, Midtøsten – til millioner av nødstedte flyktninger. In hopefull wishes for a common future. I was born into the possibility of a new world . I am one among a generation that today has the means to be informed of his fellow people in all corners of the world. Our perception is one that is global, yet I am saddened to see our consideration growing narrow. Our walls are reaching higher and we are mistaken to think that we are immune to each others sarrow. Day by day the need for solidarity deepens. From climate change to security fascism barring our rights we face the same challenges. I am here to ask only for your consideration. My father was in jail for 92 days along with his Ankara Bureau Chief Erdem Gul for publishing evidence of an illegal arms transfer. Fascism in it’s core is the decisive systemic recycling of a false perception. I was witness first hand to this fact. The government and the President of the Republic Erdogan embraced the narrative that father and Erdem were not journalists but spies, aiding an armed terror organization attempting to overthrow the government. I must’ve heard this, and I am not exaggerating, hundreds of times in progovernment newspapers, radios, TV channels and more. The argument was that it was treason to publish the story because it was state secret. The duty of a journalist is never to safeguard the dirty dealings of the state. If it were, we would’ve never known of Irangate, Watergate, Ponting Affairs and many more. So we tried our best to voice our cause. Dad and Erdem wrote a letter to all European leaders attending a summit in Brussels with Turkey, warning them of the criminal activity of the gov. and their attempts to muzzle any critical perspective that saw 34 journalists jailed including them. The summit was a shamefull attempt by the EU to stop the flow of refugees by paying Turkey to become a concentration camp and promising entry to Schengen areas. Walking into the summit the leaders had dad’s letter in one pocket and the 3bn euros they would give to Turkey on the other. Ultimately the money in the right pocket overshadowed the letter in the left. There was not a single mention by any of the leaders in the summit smiling and posing for the cameras with the prime minister of the core values of European democracy such as freedom of expression and speech. The EU abetted Turkey’s crimes in fear of people escaping a war that they partially fueled. Thankfully the Constitonal Court set dad and Erdem free a week ago. Yet Erdogan empowered by the legitimacy granted by the EU had the guts to say he doesn’t respect nor will he abide by the CC ruling.I think being an ally is not solely about arms and armies but about safeguarding democracy. Not about abetting crimes but about helping to correct them. We are not free in a narrow consciousness and a bright future ultimately calls for common care. For some its too good to be true but nothing is to change until we start to believe. Altough dad and erdem are free absurd charges remain against them and they are being tried for 2 life sentences still and Erdogan is more oppressive by day. You can help by showing solidarity and voicing these illegal arms transfers and calling out such shamefull agreements and dad and erdem can help reveal the ugly truth in Syria if they are allowed to work. In hopefull wishes for a common future, I thank your consideration. Den tyrkiske journalisten Can Dündar, som er ein av Norsk PENs æresmedlemmer, blei saman med sin kollega Erdem Gül arrestert 26. november i fjor. For alminneleg kritisk journalistikk risikerer dei no livstidsdommar. PEN krever at tyrkiske styresmakter set Dündar og Gül fri og fråfell alle tiltalar mot dei. Norwegian PEN has been deeply concerned at the arrest and detention of one of our Honorary Members, Can Dündar, and his colleague Erdem Gül. Now we are scared by the news that the Istanbul Deputy Chief Public Prosecutor is seeking an aggravated life sentence against the journalists. The sentences sought are much heavier than expected, and seem totally unreasonable. The whole world can see that the espionage and national security charges against them is just a politically motivated move attempting to censor and silence opposition voices. Together with PEN International we call for the immediate and unconditional release of both journalists. We call on Turkish authorities to drop all charges against Can Dündar and any other Cumhuriyet staff members which are connected solely to their peaceful exercise of freedom of expression in their duties as journalists. Turkey has the obligation to respect the right to freedom of expression under the European Convention on Human Rights and the International Covenant on Civil and Political Rights, to which it is a State Party. We especially appeal to you, Mr. President, to stop bringing cases against writers and journalists engaging in legitimate and political criticism. Detaining independent journalists and silencing critical voices has a too big prize, both for the persons silenced and for the country as a whole. Norwegian PEN is appalled at the news that yet another defamation case is being brought against high profiled Turkish journalists. We need to express our grave concern at the arrest and detention of Can Dündar and Erdem Gül on 26 November 2015 on espionage and national security charges, which we believe is a politically motivated move attempting to silence opposition voices. We must ask you to stop bringing cases against journalists and writers engaging in legitimate political criticism, as Turkey has the obligation to respect the right to freedom of expression under the European Convention on Human Rights and the International Covenant on Civil and Political Rights, to which it is a state party. As Can Dündar puts it himself: «We are not traitors, we are journalists». Norwegian PEN share PEN International’s belief that Dündar’s article constitute legitimate political criticism, and we call for the immediate and unconditional release of both journalists. Can Dündar and any other Cumhuriyet staff members should be given the chance to continue what is simply their duties as journalists. I går kom nyheten fra Tyrkia om at sjefsredaktør og æresmedlem i Norsk PEN Can Dündar og journalist Erdem Gül i den tyrkiske dagsavisen Cumhuriyet er blitt arrestert, anklaget for spionasje, forræderi og å være medlemmer av en terrororganisasjon. Anklagene kan føre til fengsel på livstid. Norsk PEN fordømmer arrestasjonene av de to journalistene på det sterkeste. Årsaken til arrestasjonen er at Cumhuriyet har offentliggjort bilder av lastebilkaravaner fylt av våpen som kjører over grensen fra Tyrkia til Syria, angivelig på vei til ekstremistiske opprørsgrupper som kjemper mot det syriske regimet og al-Assad. Tyrkiske myndigheter på sin side har hevdet av bilene inneholdt medisinsk nødhjelp som skulle til turkmenere i Syria. Etter avsløringene gikk Tyrkias president Recep Tayyip Erdoğan personlig til søksmål mot Can Dündar og anmodet om at han skulle dømmes til livsvarig fengsel. Da Dündar og Gül stilte til rettsmøte i går, ble de altså begge arrestert og står nå i fare for å bli dømt til fengsel resten av livet. «Vi er ikke spioner, vi er ikke forrædere, vi er ikke helter; vi er journalister», skal Dündar ha uttalt utenfor rettslokalet. Saken er nok et alvorlig eksempel på at Tyrkia under president Erdoğan er blitt et aggressivt og undertrykkende regime der det ikke lenger finnes ytringsfrihet og en fri presse. Norsk PEN mener at norske myndigheter, som en alliert med NATO-landet Tyrkia, nå må bryte tausheten og protestere overfor president Erdoğan mot kneblingen av journalister og den tragiske utviklingen i landet. Norsk PEN krever at Can Dündar, Erdem Gül og andre uavhengige journalister og skribenter i Tyrkia løslates umiddelbart, at alle anklager mot dem bortfaller og at tyrkiske myndigheter tillater full ytringsfrihet for landets innbyggere. The Norwegian Writers in Prison Committee hereby ask the President to stop bringing criminal defamation cases against writers and journalists engaging in legitimate political criticism. Especially we ask the President to drop the cases against the writer Can Dündar because of his three legitimate critical articles published in Cumhuriyet newspaper and its webpage. We will remind the President that the limits of acceptable criticism of politicians and senior public officials are wider than for private individuals, as has been determined repeatedly in international law such as in the case of Tuşalp v Turkey before the European Court of Human Rights. We will also remind the President that Turkey has the obligation to respect the right to freedom of expression under the European Convention on Human Rights (ECHR) and the International Covenant on Civil and Political Rights (ICCPR), to which it is a state party. We are looking forward to the absolute withdrawal of all charges against Can Dündar.